I don't know if you guys have looked at a calendar recently, but uh, it's almost 2010. Twenty ten! This boggles my mind. So much happened in 2009: I stuck my feet in the Pacific ocean for the first time, I moved in with a boy(! ), I caught the canning bug, and boy-oh-boy did we go to a lot of weddings.The end of a year seems like a good time for reflection, so let's take a little peek back and see what we learned this year. 1. People like dessert. 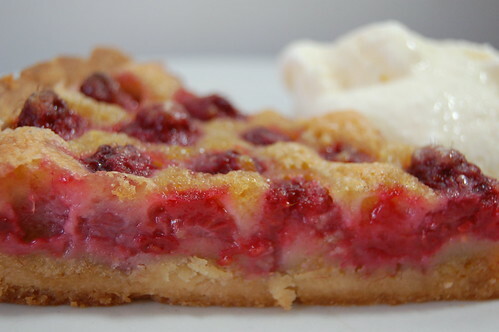 This brown butter raspberry tart is my most popular post of the year. 2. Hungry Bruno readers aren't steak people. 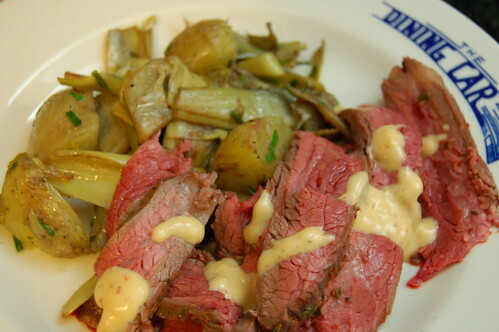 Flank steak with potato artichoke hash and the big piece of meat I put on top of blue cheese risotto were two of the least popular posts this year. 3. Chips do not have to be made of potatoes. 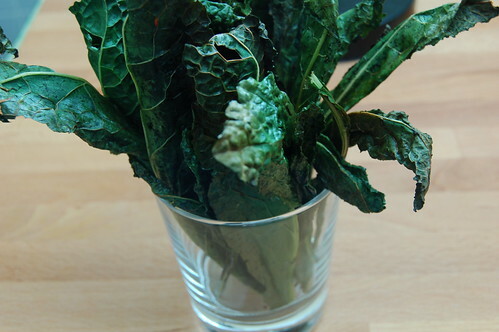 I dare say that kale chips are more addictive than their spud based forebears. 4. Old dogs can learn new tricks. I can learn to love mussels. 5. Patience is a virtue. Homemade vanilla extract takes 3 months. 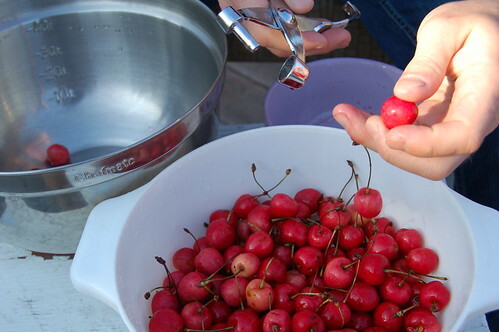 So does homemade cherry liqueur. 6. French toast does not have to be sweet. I like it better with cheese and tomatoes. 7. Leftovers are a good thing. You can slap them on pizza or mix them up with lettuce and call it salad. And how was your twenty-aught-nine? What did you learn? 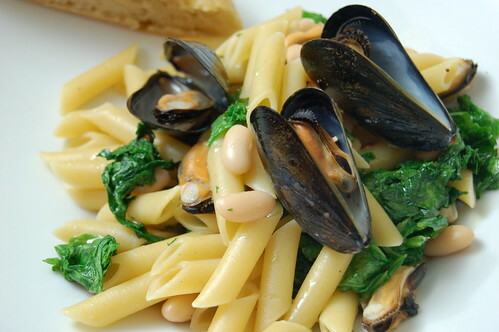 What was the best thing you ate, and was it something you cooked for yourself? Here's wishing you and yours a joyful and well fed 2010! Oh my goodness. 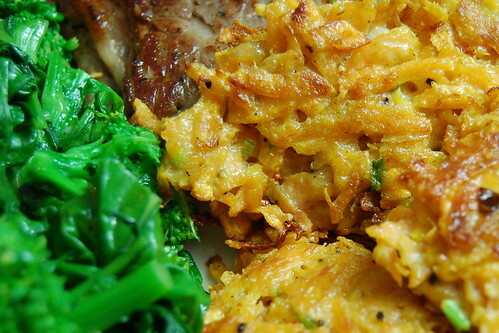 Has it seriously been NEARLY A MONTH since I told you about sweet potato latkes? My friends, it appears December has gotten the better of me. No no, it's not that I haven't been cooking! It's the holidays; I most certainly have been cooking, and I've done a LOT of baking. I made these sweet, sharp, unstoppable ginger chocolate chip cookies no fewer than four times. Those cardamom pistachio cookies over on The Wednesday Chef? Twice. They're subtle, mysterious, and a great foil for the in-your-face combo of peppermint and white chocolate we are often assaulted with this time of year. I've made at least five loaves of dill bread. I made three panettone: one for my Sicilian landlord, one for my mom, and one for my Nonna. I made a blueberry pie for Christmas dessert, and we ate it with my mom's homemade chocolate chip ice cream. For Christmas dinner, we had a big, gorgeous prime rib roast and I made eggy, sky-high yorkshire puddings. In the non-carbohydrate arena I've been less successful. 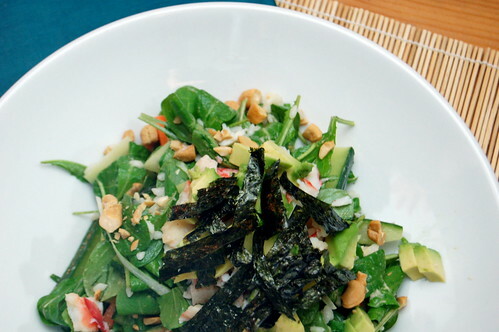 I tried a riff on this warm rice salad from the New York Times, but I couldn't find smoked duck so I used smoked turkey. Way too much smoked turkey. It was a heavy, greasy mess, but we ate it anyway. These little appetizers I'm about to tell you about fall into the carbohydrate category I suppose, and perhaps that's why they work so well, but they are the savoriest little buggers and wonderful for parties. Like, say, that party you're going to on Thursday? 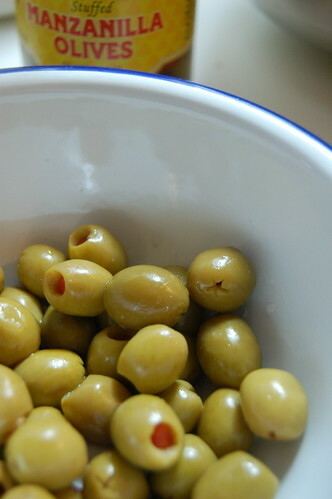 Start with some small green olives stuffed with pimento. These little Manzanilla olives are just the right size, no bigger than my thumbnail. 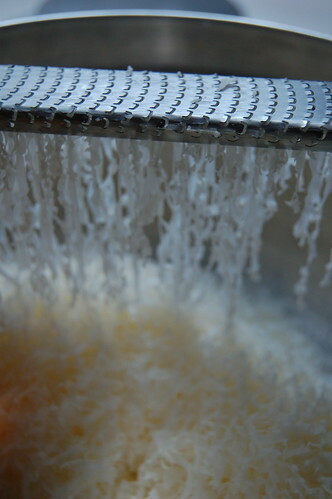 Grate up a flurry of cheddar cheese - I always double the original recipe because these things fly out of the bowl and 24 just isn't enough. I usually use Cabot extra sharp, and half a block is about enough (a block is 8 ounces) The tiny little shreds from a microplane make the dough cohesive; you don't want to use pre-shredded cheddar here or the big chunks will make the dough lumpy. 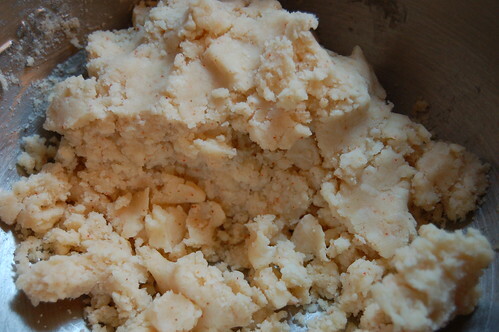 Smush that together with a cup of flour, half a stick of softened butter, and as much cayenne as you can handle. I use about half a teaspoon here - more than the original recipe, but not enough to overpower the brine with heat. 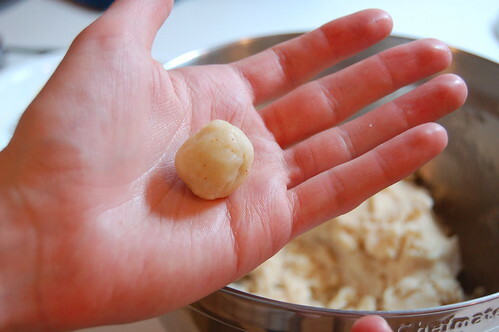 I also add a splash of the olive juice from the jar to bring the dough together, but you might not need it. 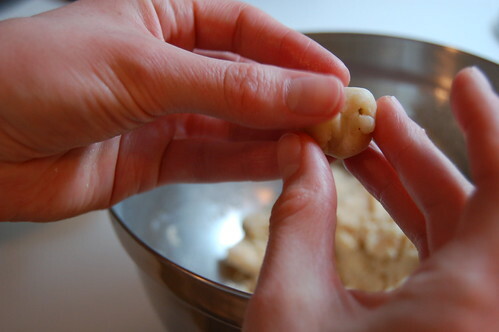 Also keep in mind that the olives will still be a little wet and that will help he dough hold. 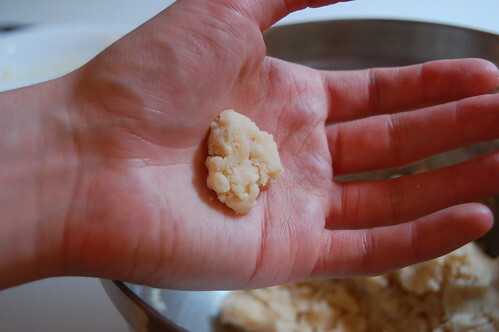 Break off a small chunk of dough. It's easier to start with too much and tear the excess off. Make a little pocket with your thumb. 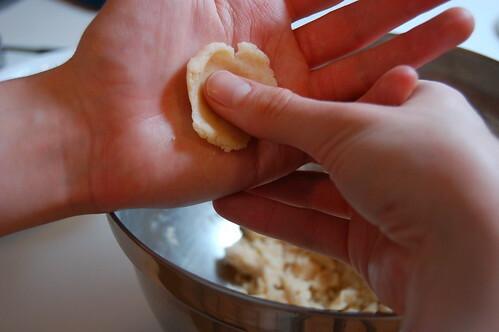 The heat of your hands helps the dough go from crumbly to smooth. Pop an olive in there, and begin to close it up. 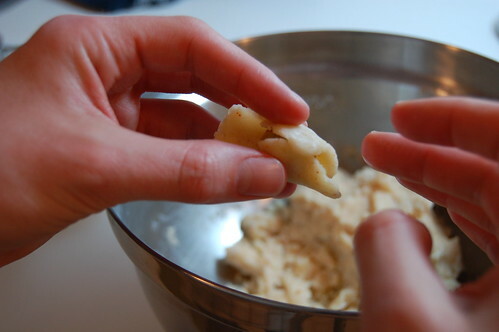 Fold two sides together, then pinch the ends closed. Pinch the holes closed or roll it gently to make it a smooth-ish ball. Lay the olives out on a baking sheet lined with parchment. And bake! Don't worry if the dough splits away from some of them, they'll still be delicious and you can just eat those ones in the kitchen before anybody sees. 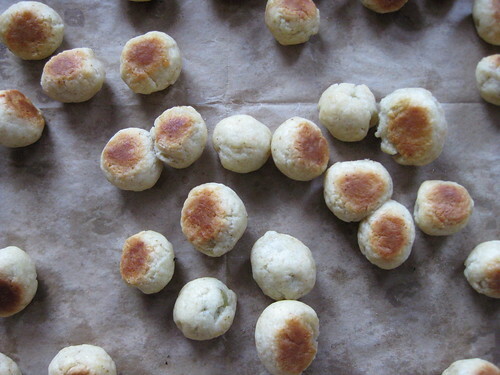 Combine butter and cheddar in a bowl, and add the flour and cayenne. 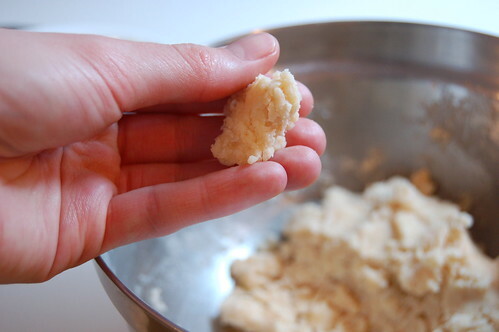 Smush it together with a wooden spoon or your hands until it starts to come together as a crumbly dough. You may need to add a little of the olive juice to make it go from crumbs to dough, but do so sparingly, start with a couple of teaspoons and add it slowly. 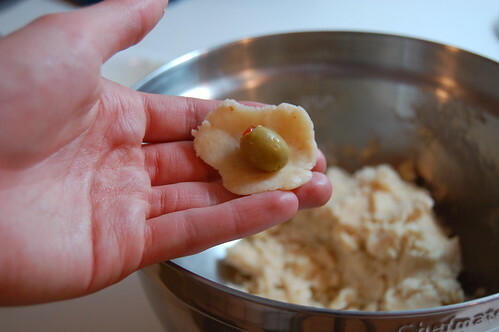 Break off a small chunk of dough, press it in your palm into a sheet, and wrap it around an olive, rolling and pinching to surround the olive completely. 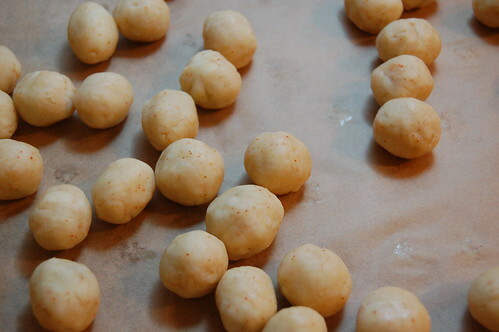 Repeat with remaining olives, and lay them on a parchment lined baking sheet. These freeze beautifully at this point - stick the whole sheet in the freezer for an hour, then take the individual frozen olives and put them in a freezer bag. 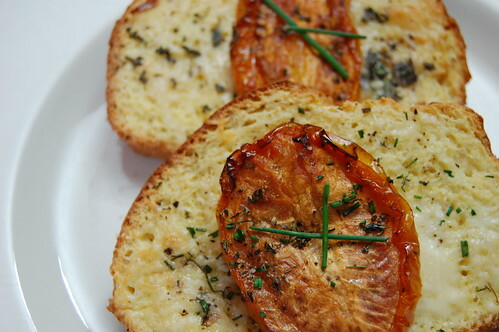 You can bake them all or just a few straight from the freezer, they just need an extra couple of minutes. 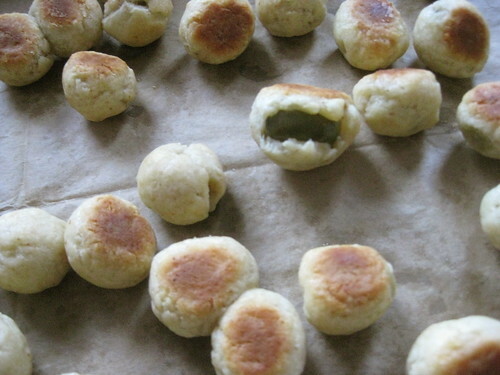 Bake olives for 15-20 minutes, or until the pastry is golden. If you think of it, turn them over once, but it's not completely necessary. Makes 4-5 dozen olive poppers. Hello my friends! Did you all have a wonderful Thanksgiving? Mine was a delight - we had a 28 pound turkey for only seven people, so I've been eating leftovers for days and days (and days). If you have any leftover sweet potatoes that didn't get marshmallowed, pureed or turned into soup, you should change things up this week and make some sweet potato latkes. I fried these puppies up the week before Thanksgiving, knowing I would be eating so many leftovers and that I would still want to participate in the very first Gourmet, Unbound. 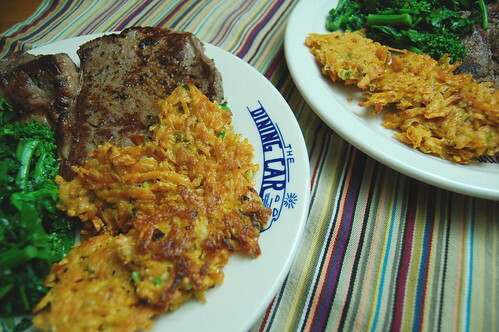 We had them with a simple steak (done the Steamy Kitchen way) and broccoli raab with lemon. Since the pancakes really show off the sweetness of the potato, I thought the bitter green was a particularly nice foil. I only made a half recipe since it was just the two of us, and we ate every last one. Next time (and there will be a next time) I'll make the whole thing, since I suspect they would re-heat well in a toaster oven for breakfast, or topped with a little dollop of sour cream and more green onions as an appetizer. My half-recipe measurements are below; for the full recipe click the link above. Heat enough oil to cover the bottom in a deep 12-inch nonstick skillet over moderately high heat until hot but not smoking. Working in batches of 4, spoon 1/8 cup potato mixture per latke into oil and flatten to 3-inch diameter with a slotted spatula. Reduce heat to moderate and cook until golden, about 1 1/2 minutes on each side. Transfer latkes with spatula to paper towels to drain. If you aren't ready to eat them immediately (for instance if your broccoli raab is still not done), latkes can be held in a 200 degree oven for at 15 minutes.